Plans for a new station on the eastern side of Okehampton (close to the A30 junction) to provide a parkway facility in support of a regular service to Exeter have been ongoing for some time. This situation is almost inextricably bound up with national franchising problems, politics and financial considerations. The Devon & Cornwall Railway reached Sampford Courtenay, 10 miles from Coleford Junction, in 1867 though the station at that time was called Okehampton Road and was also later briefly called Belstone Corner. A relatively modest single storey station building was constructed on the up platform, with a stone waiting shelter on the down platform. The station became an unstaffed halt in 1964, and closed to passengers in 1972. Today little remains of the station buildings. The station is served by some Dartmoor Railway trains to/from Okehampton, and the summer Sunday Rover services from Exeter to Okehampton. From Sampford Courtenay the line continues for 4 miles, crossing Fatherford Viaduct over the East Okement river, before reaching Okehampton. Station Facilities: Small Car Park. Sampford Courtenay station after a pre-season tidy-up by the Station Maintenance team. Services to Okehampton began on 3rd October 1871 and it grew into an important junction station. The station was redeveloped into its present format during the early 1930s. The engine shed, turntable and water tower were located at the east end of the station, which is today part of the car park. The original 1871 signal box on Platform 2 was replaced with a brick-built structure on Platform 3 in 1935 which remains to this day. Beyond Okehampton towards Meldon Viaduct is the site of the former military sidings, which was the nearest point on the railway to the large military camp on the moor above. Troops, munitions, horses and ordnance were loaded and unloaded here in vast numbers. From 1960 to 1964 a car carrier service operated on Saturdays from Surbiton (in southwest London), and cars were loaded and unloaded at the military sidings. The station fell into disuse after the withdrawal of passenger services on 5th June 1972. However, following significant refurbishment Okehampton station officially reopened on 24th May 1997. Today Okehampton station serves as the headquarters of the Dartmoor Railway and the former goods shed is now a Youth Hostel. Station Facilities: Ticket Office, Buffet, Museum, DRSA Shop, Toilets, Large Car Park. Please check for opening times. The quarry at Meldon, 2.5 miles beyond Okehampton, was purchased by the London & South Western Railway in 1897 to provide track ballast. A small station at Meldon Quarry Halt was constructed during the 1920s but the larger station that exists today has been in use since 2000. Meldon Quarry signal box, now no longer present, opened in 1903 and closed in 1970. A unique feature was the steel mesh over the windows to protect the box from flying debris during blasting in the quarry. Stone trains continued to operate to Meldon until the closure of the quarry in 2011. Meldon is also the location of the Dartmoor Railway rolling stock workshop. Regrettably this is not accessible by the public as it is within the grounds of the privately-owned quarry. 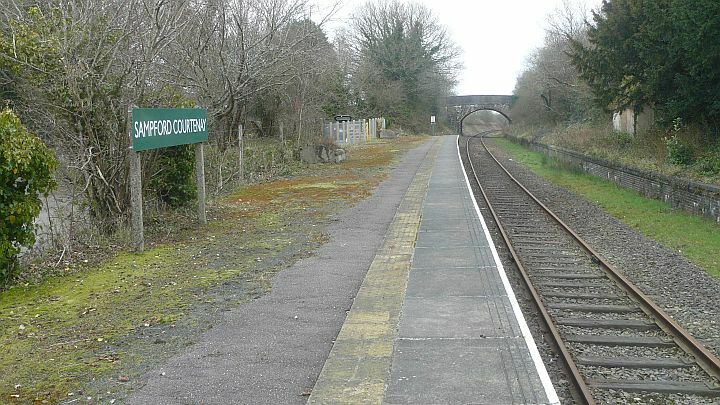 The name of the station was changed from Meldon Quarry to Meldon Viaduct with the erection of a new running in board in July 2015. Station Facilities: Meldon Buffet, Toilets. Please check for opening times. Beyond Meldon, the Granite Way trail continues across Meldon Viaduct (built 1874) which spans the valley of the West Okement, an area rich in limestone, copper and aplite mining remains from previous centuries. (More details in our Exploring Meldon (274Kb) info sheet). The Granite Way proceeds along most of the former trackbed for about 8 miles as far as Lydford. Shortly after the viaduct is the site of Meldon Junction, where the lines to Padstow and Bude once branched off. The former main line to Plymouth continued through Lydford, Tavistock and Bere Alston. Meldon Summit, to the west of Meldon Junction, was the highest point on the line and also the highest point on the whole of the Southern Railway at 950 ft (290 m) above sea level. Following the huge disruption to rail access west of Exeter caused by the damage to Dawlish sea wall early in 2014, reinstatement of the former LSWR line between Meldon and Bere Alston (and upgrade of other parts of the line) was one of the options considered for a diversionary route. Network Rail's report is here. Time will tell.